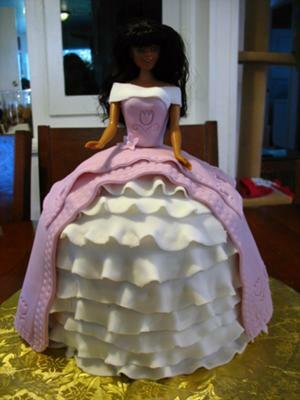 For this Barbie cake, I used 2 round cakes of 8 in, the tall ones, then I used chocolate evil mix. I cut in half and I used raspberry syrup between each layer I used chocolate filling, then a cover of chocolate ganache. I used fondant color pink and white, then I used a little white shimmery dust. I got a half doll from the Wilton, also I used the tools from the first course of cake from Wilton.